Wood screws are manufactured in many different lengths, diameters and styles. Wood screws in structural framing applications such as fastening floor sheathing to the floors joists or the attachment of gypsum wallboard to wall framing members. Wood screws are often higher in cost than nails due to the machining required to make the thread and the head. Screws are usually specified by gauge number, length, head style, material and finish. Screw lengths between 1 inch and 2 ¾ inch lengths are manufactured in ¼ inch intervals, whereas screws 3 inches and longer, are manufactured in ½ inch intervals. Designers should check with suppliers to determine availability. Design provisions in Canada are limited to 6, 8, 10 and 12 gauge screws and are applicable only for wood screws that meet the requirements of ASME B18.6.1. For wood screw diameters greater than 12 gauge, design should be in accordance with the lag screw requirements of CSA O86. Screws are designed to be much better at resisting withdrawal than nails. The length of the threaded portion of the screw is approximately two-thirds of the screw length. Where the wood relative density is equal to or greater than 0.5, lead holes, at least the length of the threaded portion of the shank, are required. In order to reduce the occurrence of splitting, pre-drilled holes are recommended for all screw connections. 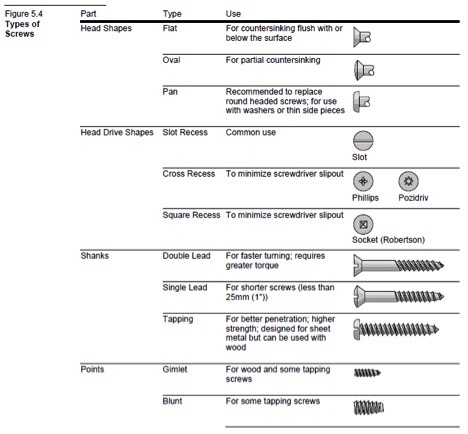 The types of wood screws commonly used are shown in Figure 5.4, below.